Quinoline was first extracted from the coal tar in the year 1834 by Friedlieb Ferdinand Runge. Coal tar remains the main source of commercial quinoline. 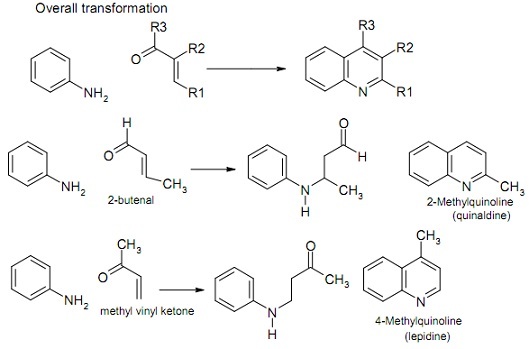 This can be synthesized by different methods like the Skraup, Dobner-von Miller Synthesis, Conrad-Limpach, Friedlaender and Pfitzinger synthesis. The Aniline, glycerol, nitrobenzene, iron (II) sulphate and sulphuric acid are mixed and gently heated. The vigorous exothermic reaction takes place that is completed by further heating. After the elimination of residual nitrobenzene by distillation in steam, quinoline is released from the reaction mixture via basification and is isolated by steam-distillation. The result of the purified product is 84 to 91%. 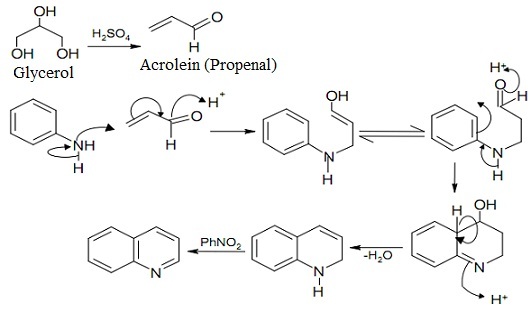 The reaction comprises dehydration of glycerol to propenal (Acrolein), Michael-type addition of aniline to propenal, acid-catalyzed cyclisation and dehydrogenation by nitrobenzene (fig shown below). Iron (II) sulphate acts to moderate the reaction. The propenal itself is not used due to its tendency to polymerize. The success of the reaction based on the rapid addition of aniline to the propenal as it is formed. The synthesis is of broad application particularly for the synthesis of quinoline substituted in the benzene ring. The aniline might have nuclear substituents: ortho- and para-substituted anilines give 8- and 6-substituted quinolines, correspondingly, and meta-substituted anilines provides mixtures of 5- and 7-substituted quinolines, the latter predomination with activating substituents like methoxyl and the former predominating by deactivating substituents like nitro. Propenal might be substituted by 2-butenal providing 2-methylquinolines and by butanone, providing 4-methylquinolines. The reaction employs pre-formed α, β-unsaturated carbonyl compounds rather than acrolein. This is employed to give alkyl and aryl substituents in the 'pyridine' half of the quinoline. The intermediate β-aminocarbonyl compound can be isolated and this exhibits that the mechanism begins by a conjugate addition. The intermediate might then be subsequently cyclised under a variety of conditions (figure shown below). β-keto esters react by aniline in each of two manners; at low temperatures reaction takes place at the keto-group to provide an imine and at high temperatures reaction takes place at the ester group to provide an amide. The resultant compounds can each be cyclised to the quinolines (figure shown below). The o-aminobenzaldehyde is treated by an aldehyde or ketone in a basic medium; formation of the imine is obeyed by dehydrative cyclisation (figure shown below). The major problem by this synthesis is that o-aminobenzaldehyde is very unstable, readily undergoing self-condensation. One way of overcoming this is to start rather by an o-nitrobenzaldehyde: acid- or base-catalyzed reaction provides an intermediate that cyclises spontaneously on reduction. This is the modification of Friedlander's method and uses isatin in place of 0-aminobenzaldehyde. Reaction by the base provides o-aminobenzoylformate ion that reacts by an aldehyde or ketone to provide a 4-carboxyquinoline from which the carboxyl group can be eliminated thermally (figure shown below).